for mezzanine floors and sanitary framing. 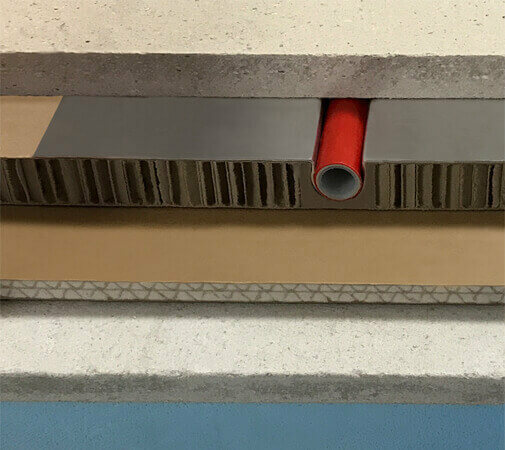 The sandwich panel is made up of a plaster fibreboard plank, an extruded polystyrene continuous insulation core and a second plaster fibreboard plank. Different types of structures: steel, wood, galvanized steel, etc. The sandwich panels are installed on the bearing structure. A EPDM strip is recommended to reduce impact noise transmission. Then, a high density plank is installed for resolution and acoustic condition. The THERMOCHIP FLOOR panel gives the mechanic performance required and a more efficient continuous thermal insulation. The THERMOCHIP FLOOR PLUS system, apart from the panel, adds a high density plank to reduce airborne and impact nose and an industrialized technical panel for under floor heating system. Changes could be made depending on the energy requirement demands. This panel, which has been made ad hoc and longitudinally mechanised, has a heating pipe within. A plaster fibreboard is also installed which will be the supporting flooring base of the building (for wood, ceramic tiles, etc.). All this makes up a complete system for the dry construction you desire. The design and development of the FLOOR PLUS system can be used with the BIM method and can be adapted to each project. It is a sandwich panel made of a plaster fibreboard plank, a extruded polystyrene insulated core and a second plaster fibreboard plank.